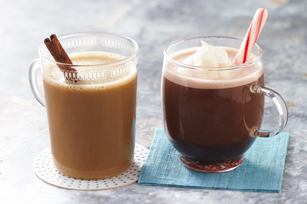 This glorious hot chocolate gets its peppermint flavor straight from a finely crushed candy cane. Add a dollop of whipped topping and enjoy! Prepare T DISC in same mug; stir until candy is completely dissolved. For a festive twist, add a candy cane to filled mug; use as a stir stick. Or, sprinkle additional crushed candy over hot chocolate in mug.